Washington, D.C.--Amidst a shrieking crowd, President Obama marked his 100th day in office with a spectacular surprise photo-op that brought many to tears, others to their knees, and still others to emergency psychiatric wards. To celebrate the control he has achieved over vast swaths of America’s industrial policy during his first few months in office, the White House arranged an unannounced publicity event that included a fleet of giant excavation machinery that surrounded tourists and other visitors on the National Mall. Thunderous roars shook the ground as four-story bulldozers and mammoth earth-moving equipment suddenly emerged from a normally placid reflecting pool like multi-headed Beasts, blocking out the sun. 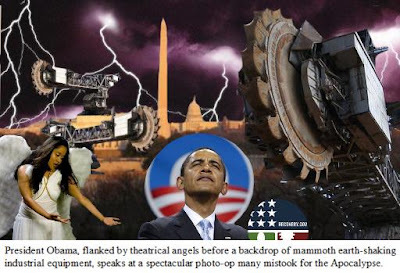 The angels -- Victoria’s Secret supermodels hanging from invisible wires – flanked the steps of the Lincoln Memorial as four of Obama’s cabinet members rode in on horseback, representing the Treasury, Transportation, Commerce, and Labor Departments. Obama made his surprise entrance by running through seven large paper seals featuring the symbol used to mark construction projects funded by the massive federal spending bill enacted earlier this year. Some nay-sayers said the Administration’s quest for the “perfect photo-op” may have gone too far this time, in the wake of another unannounced photo-op in which a plane used as a backup for Air Force One swooped low in the sky over New York, causing mass panic in Manhattan, which had been the target of terrorist attacks that killed 3,000 people in September, 2001.